Senior management and leaders within companies embroiled in crisis, have learned the hard way what happens when the unthinkable becomes a reality - an accident results in death or injury; a failed company takeover causes share prices to plummet; or toxic food, medicines and drinks leads to mass hysteria. All attention focuses on the guilty parties - and the media can be expected to make this crisis headline news within a matter of hours. No company or organisation is immune to crisis. Everyday, organisations run the risk of being affected. However, a crisis does not necessarily have to turn into a disaster for the business or organisation involved. Crisis Communication provides readers with advice on how to limit damage effectively by acting quickly and positively. 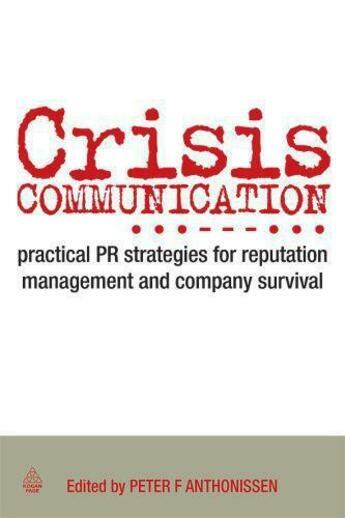 Moreover, it explains how to turn a crisis into an opportunity by communicating efficiently, through the use of successful public relations strategies. Providing information on accountability; crisis communication planning; building your corporate image; natural disasters; accidents; financial crises; legal issues; corporate re-organisation; food crises; dealing with negative press; media training; and risk managers, Crisis Communication is a thorough guide to help prepare your organisation for any future calamities. Including international case studies, crisis communication checklists and sample crisis preparation documents, this book ensures that you are fully prepared for the absolute necessity of proactive crisis communication and proper planning, should you be confronted with a crisis.